On this date in 1817, the day before he left his Roman holiday for Venice, Lord Byron saw three criminals beheaded at the Piazza del Popolo. He wrote all about it in his correspondence with John Murray. The day before I left Rome* I saw three robbers** guillotined. The ceremony — including the masqued priests; the half-naked executioners; the bandaged criminals; the black Christ and his banner; the scaffold; the soldiery; the slow procession, and the quick rattle and heavy fall of the axe; the splash of the blood, and the ghastliness of the exposed heads — is altogether more impressive than the vulgar and ungentlemanly dirty ‘new drop’, and dog-like agony of infliction upon the sufferers of the English sentence. Two of these men behaved calmly enough, but the first of the three died with great terror and reluctance, which was very horrible. He would not lie down; then his neck was too large for the aperture, and the priest was obliged to drown his exclamations by still louder exhortations. The head was off before the eye could trace the blow; but from an attempt to draw back the head, notwithstanding it was held forward by the hair, the first head was cut off close to the ears: the other two were taken off more cleanly. It is better than the oriental way, and (I should think) than the axe of our ancestors. The pain seems little; and yet the effect to the spectator, and the preparation to the criminal, are very striking and chilling. The first turned me quite hot and thirsty, and made me shake so that I could hardly hold the opera-glass (I was close, but determined to see, as one should, see every thing, once, with attention); the second and third (which shows how dreadfully soon things grow indifferent), I am ashamed to say, had no effect on me as a horror, though I would have saved them if I could. 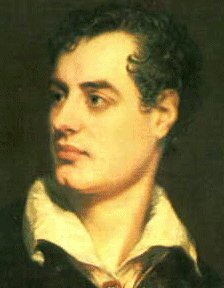 * The date is not stated directly in Byron’s missive, but his movements are known in some detail — for instance, this timeline. ** According to the notes of executioner Mastro Titta, the three criminals “‘decapitati’ al Popolo, per omicidi e grassazioni” this day were Giovanni Francesco Trani, Felice Rocchi and Felice De Simoni.